The inevitable Aussie whining season is on show. Now the latest is the complaint in some Australian media that the ‘Galle wicket may have been doctored’. This was big news in the “The Australian” soon after Sri Lanka’s series victory in Galle. Sri Lanka chief cricket curator Geoffrey Dabarera dismissed the allegations levelled by ‘The Australian’. He explained, “First, the Galle wicket was handed over to the ICC match referee Chris Broad prior to the game. From that point onwards, the wicket was shorn-off under the supervision of ICC match officials. At the same time at no point did the ball behave in an odd way during the entire game? So how could they come up with allegations which they cannot substantiate? “If the match referee saw some different patches on the wicket, he should have taken the matter up on the first-day of the Test and not on the last day of the Test, when Sri Lanka was about to win the match handsomely”. Commenting on the allegations, SLC secretary Mohan de Silva told the Sunday Times, “It was the Australian fast bowlers who bagged the major portion of the wickets that fell during the game and remember Sri Lanka too lost twenty wickets, during that game. But, during that time the good proportion of the runs were scored by the Sri Lankan lower half, which goes to prove that there were no hidden devils on the surface. We played a fair game and beat them squarely and why take the sheen out of a good victory”. Some insiders questioned as to how confidential discussions between the match referee and officials could reach the ears of the Australian press. At the same time some photo evidence of an Australian fielder tampering with the ball was rejected also by the match referee claiming the evidence was inconclusive. Home advantage is an unwritten law in International cricket and almost all International cricketers have faced the wrath of this situation one time or the other. 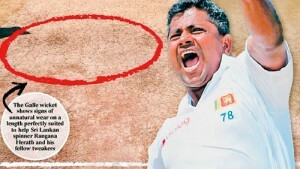 “Photographs obtained by the ‘The Australian’ of the wicket at Galle on the third day of the recent Test match show what are obvious efforts by curators to aid the local spinners. “Despite the move apparently being in breach of ICC regulations, The Australian was informed last night that Sri Lanka Cricket had escaped sanction after ICC match referee Chris Broad filed his pitch report on Tuesday. “Pitch doctoring is one of the main reasons wins are becoming harder to gain on the subcontinent. “On the last day of the Test, which the Sri Lankans won in 2½ days, Broad could be seen in animated conversation with the curator in the middle of the ground and appeared to be gesturing towards the areas in front of the crease. “Photographs obtained by The Australian show an area about two metres in front of the batting crease at either end that is prepared differently from the rest of the pitch, which has more grass on it and shows less general abrasion. The practice obviously aids local spin bowlers. “It’s understood the curator scraped up the grass in this patch to remove it entirely and the area might even have been brushed with a strong broom. “The Australian team management refused to comment on the issue when contacted yesterday. 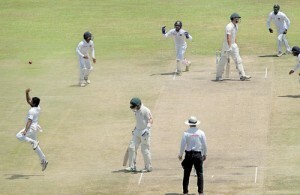 “The Galle pitch was rated “poor” by Broad after the game against Australia in 2011 and action was taken against the local board. “Michael Clarke said at the time he hated to see a game decided by the toss, while Michael Hussey rated it the driest first-day wicket he had seen in his life. “In the Test that began last week, even spinner Nathan Lyon was seen in a vigorous conversation with the groundsman before the match. “Sri Lanka won the toss on Friday and took 20 Australian wickets with just 501 deliveries, the local spinners wreaking havoc on batsmen who struggle on spinning wickets at the best of times. “If the pitch for the second Test had received a second “poor” rating, the cricket board would face a fine of up to $30,000 as it would be the second offence within a five-year period. The Test match pitch and outfield report that Broad had to complete is comprehensive, and the Galle wicket should have raised problems. “The first item on the questionnaire asks: Did the pitch have a uniform covering of grass along its entire length? Where do they draw the line?